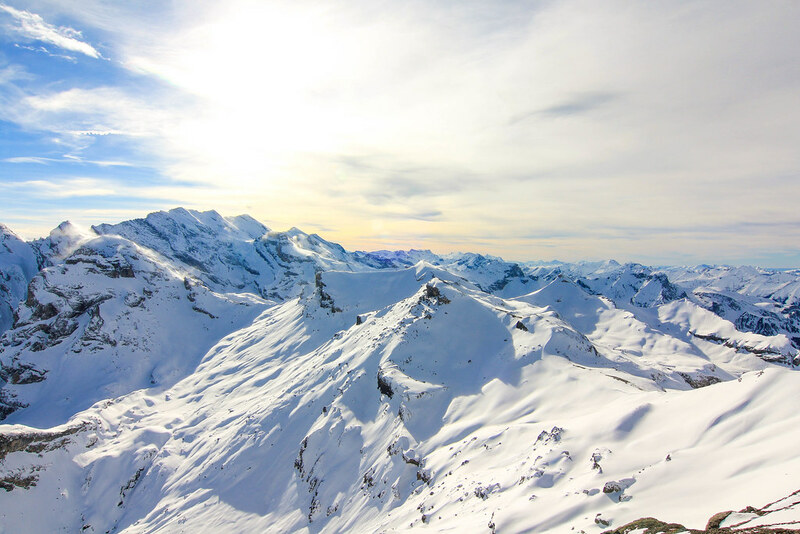 As I soared up the Alps in a packed cable car, sardined between ski poles and snowboards, Switzerland's scenery left me speechless. Snowy peaks sparkled against bright cerulean skies, while pops of color flashed below me as skiers flew down the mountain. Stunned by the sublime beauty of my surroundings, I couldn't help but feel as if I were on a movie set. But in fact, I was. 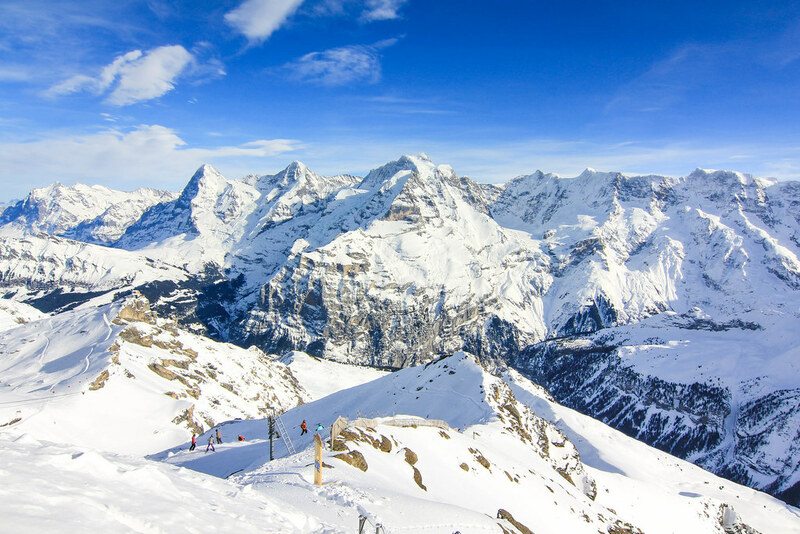 Made famous by James Bond's "On Her Majesty's Secret Service", the Schilthorn is a picturesque summit with unparalleled views of the Swiss Alps. 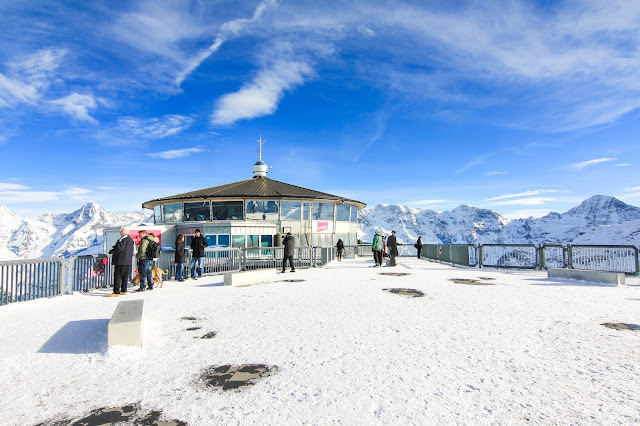 Just a short day trip from Interlaken, the Schilthorn makes for the ultimate winter wonderland. 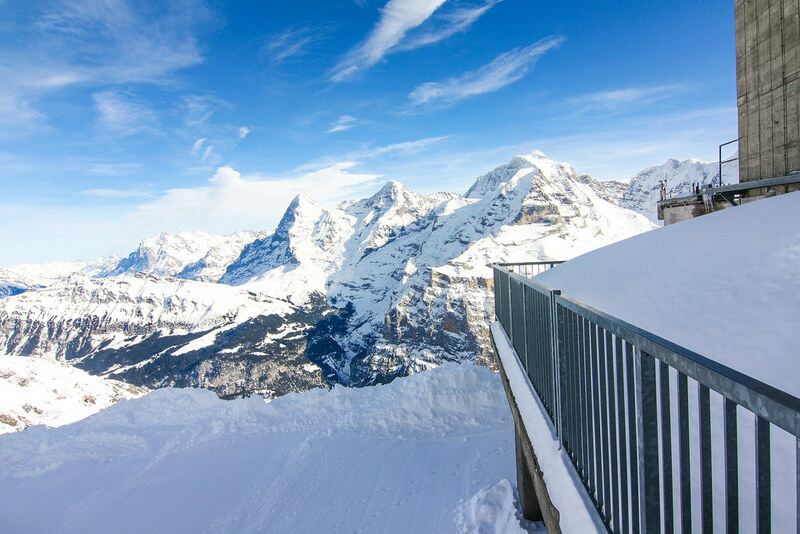 Perched atop a frosty summit, the Schilthorn boasts breathtaking panoramas of the "Swiss Skyline", including the commanding peaks of Jungfrau, Eiger, and Mönch. At 2970 meters high, one can venture above the Alps and revel in its otherworldly elegance. 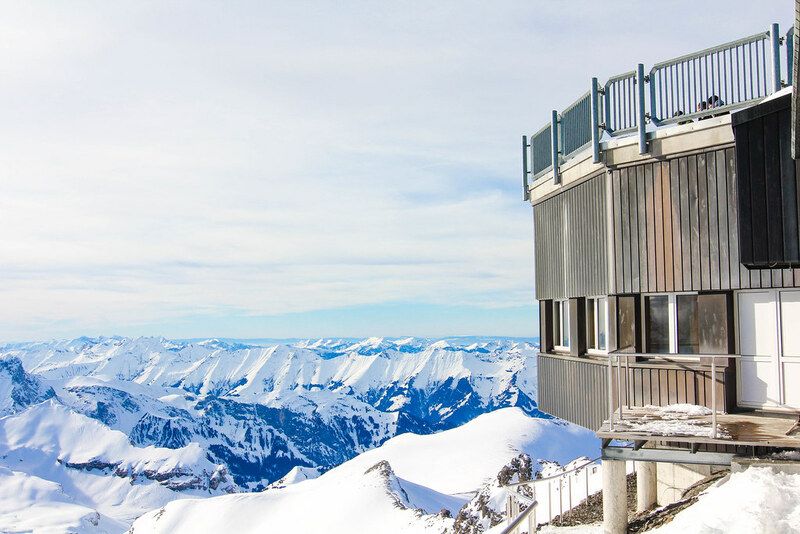 James Bond fans can explore an interactive Bond World exhibit or indulge on a 007 champagne brunch at Piz Gloria, a revolving restaurant flaunting dramatic 360 degree views. Even those unfamiliar with the Bond series are sure to be seduced by the Schilthorn's majestic vistas of the Bernese Oberland. To get to and from the Schilthorn, one must change cable cars in the charming village of Mürren. 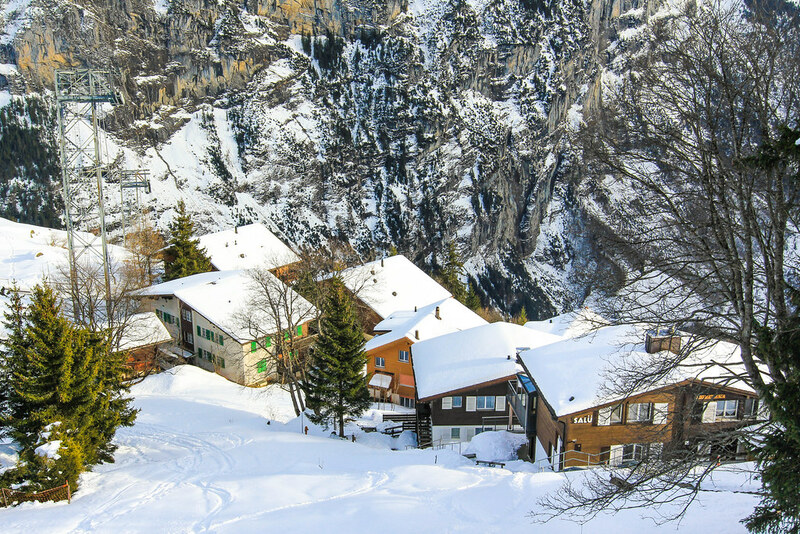 Tucked below the summit, this ski town feels straight out of a storybook. 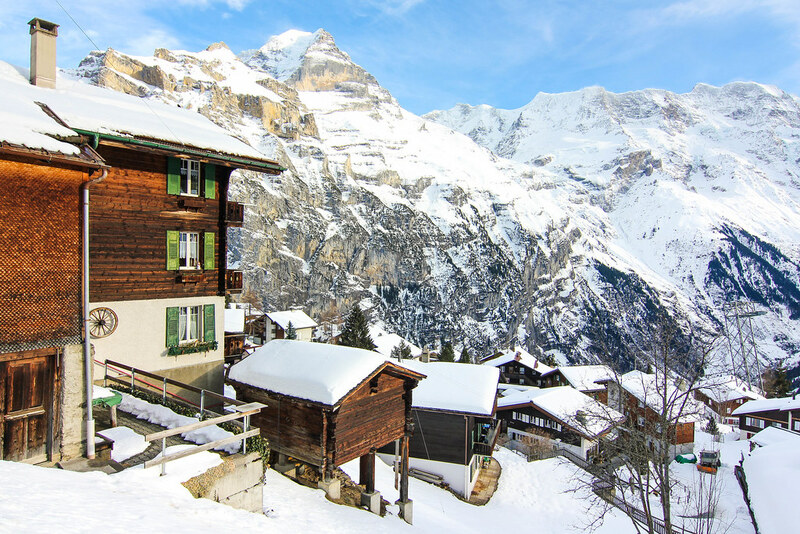 With its cozy chalets and spectacular scenery, it's well worth stopping in this mountainous paradise while making the trek up to the Schilthorn. 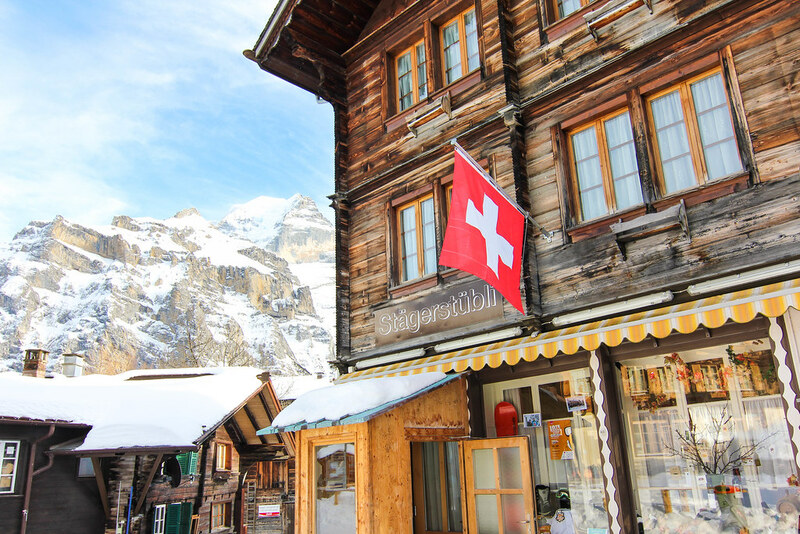 As I roamed through the snowy village of Mürren by foot, I was one of the only wanderers not traveling by skis. Every other visitor appeared to be gliding their way through town, most likely skiing back to their warm chalets to sip Swiss hot chocolate by the fire. 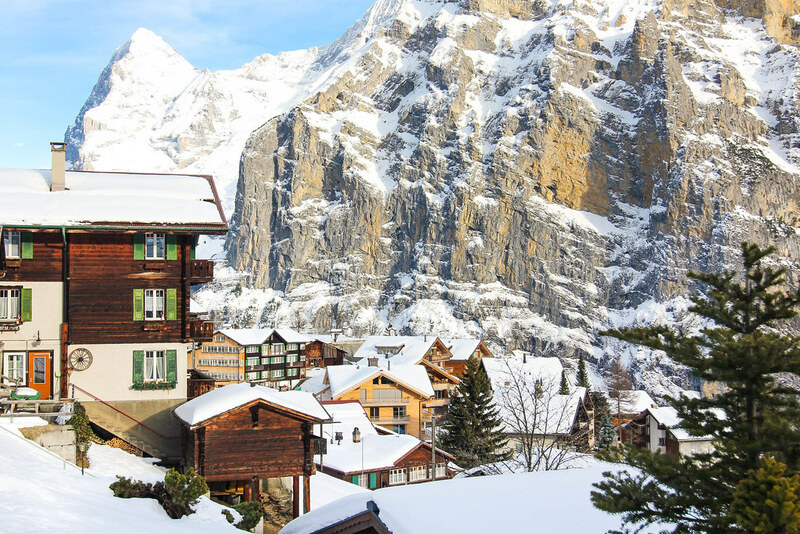 Seeing as Mürren is only accessible by cable car, the secluded alpine cabins and intimate fireside terraces seemed all the more romantic. The entire scene was almost too darling for words, and I was half tempted to quit my job and spend the rest of the winter hibernating here. To arrive at the Schilthorn from Interlaken, one must take a train and a bus, followed by a series of cable cars. While there are a handful of ways to get to the Schilthorn, I opted for the Interlaken - Lauterbrunnen - Stechelberg - Mürren route. Although the directions appear complicated, they're actually quite straightforward once you're boarding each cable car. Most tourists are also heading in the same direction, signage is clear, and the staff at each crossroads are more than willing to offer guidance. First, take a local Berner Oberland train from Interlaken Ost to Lauterbrunnen. Once you're off the train, cross the street and catch the yellow Post bus to Stechelberg Schilthornbahn. Board the cable car in Stechelberg, then switch to another cable car in Gimmelwald towards Mürren. 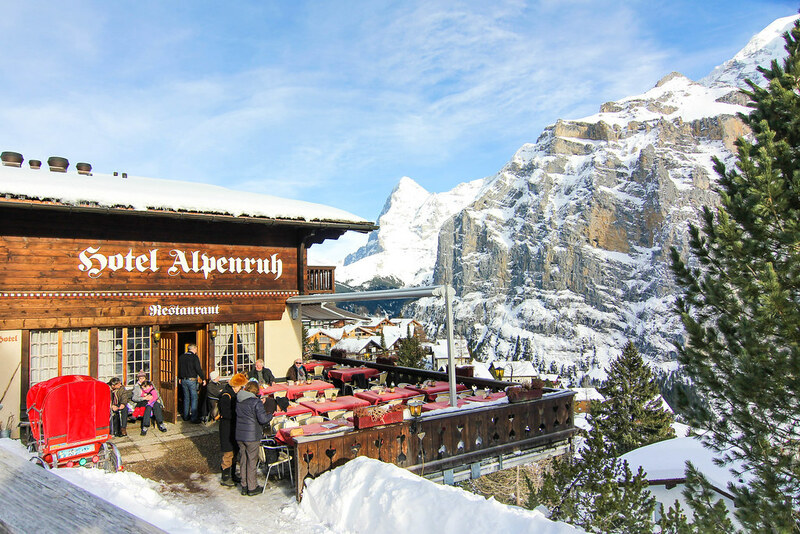 Once reaching Mürren, either board the next cable car or stop to explore the quaint ski village. 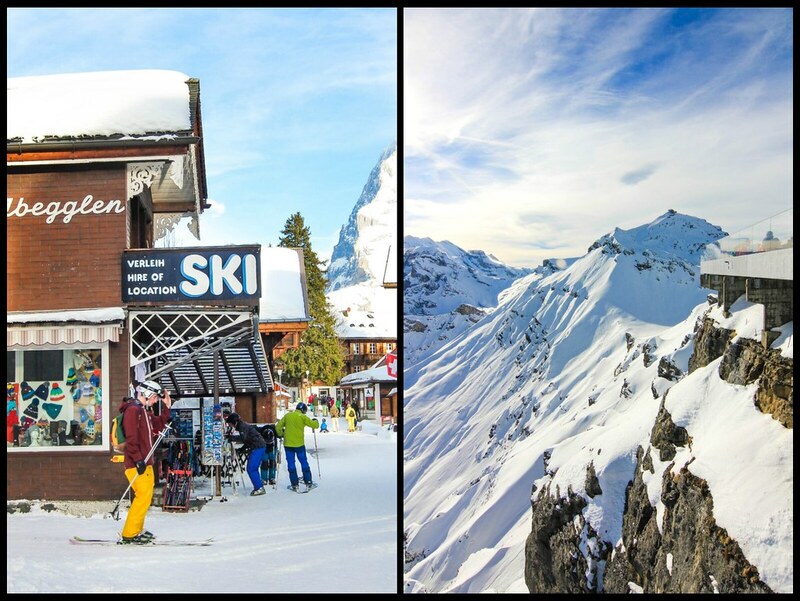 If you opt to head straight to the Schilthorn, catch the cable car in Mürren and switch to another one in Birg. 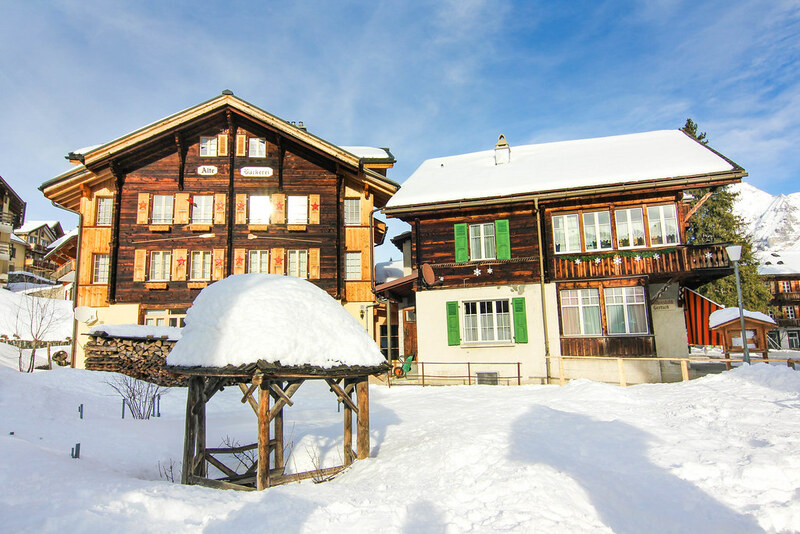 Birg offers phenomenal views of the Bernese Oberland, as well as a Skyline Walk, a Thrill Walk, and a scenic bistro. From Birg, you can take the final cable car to the summit of the Schilthorn. The entire journey takes about 90 minutes (without stopping in Mürren). Current timetables and fares can be found here. Roundtrip tickets to the Schilthorn from Interlaken Ost (without any discount rail passes) currently cost a whopping 131 CHF, which is roughly equal to $131 or 122€. Tickets can be bought right at the Interlaken Ost train station. 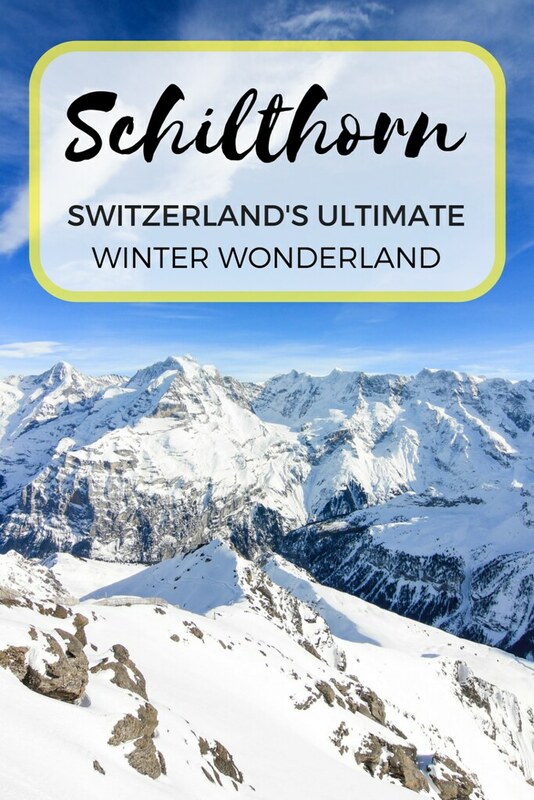 Though visiting the Schilthorn is one of the more expensive day trips from Interlaken, I thought the awe-inspiring scenery and overall experience was worth the extravagant price tag. While it meant that I had to say no to other adventures and forgo experiencing the local cuisine in lieu of cheap sandwiches made from stolen hostel goodies, channeling my inner Elsa above the Swiss Alps was decidedly priceless. That said, good weather is imperative. It's simply not worth the splurge if skies aren't clear enough to see the Schilthorn's impressive alpine views. Don't hesitate to ask your hotel or hostel if you have any doubts about the forecast or visibility. Looking for more things to do in Switzerland? Be sure to read about my experience with Skydive Interlaken! Have you ever been to the Swiss Alps? Where is your favorite winter wonderland?